Perpetual Treasuries Ltd. Continued as a primary dealer at the Central Bank even when Ajith Nivard Cabraal was CB Governor and during this period (2014) it received a profit of 400% said Chief Executive Officer of Perpetual Treasuries Ltd. Kasun Palisena. He also revealed Mr Cabraal’s sister Shiromi Wickremasinghe was a director of Perpetual Treasuries Ltd. at the time. The request by the FCID to investigate accounts in 11 banks including 4 accounts of former Parliamentarian Sajin Vaas Gunawardene has been granted by Colombo Fort magistrate and Additional District Judge Miss. Lanka Jayaratna. According to FCID officers’ submission to Court, Mr. Sajin Vaas Gunawardene has used his political privileges to assist one T. Yanthivel, a main shareholder of ‘Ceylon Tea Services’ to buy shares at a bigger price than the price that existed in the market. They pointed out that the transaction of buying shares from the EPF brought illegal profit to ‘Ceylon Tea Services’ which amounts to violating money laundering act, causing a loss to the EPF and illegal use of state resources. “We get the feeling that this government is stealing to challenge and defeat the stealing committed by the Rajapaksa regime. We cannot measure the size of stealing. There is no difference between big thieves and small thieves. These thieves who have devoured ships would say only a garlic pod has been stolen. However, what has been stolen is the funds of the people. Legal action should be carried out against all stealing whether they were committed at present or in the past,” says the Information Secretary of the JVP Parliamentarian Vijitha Herath. 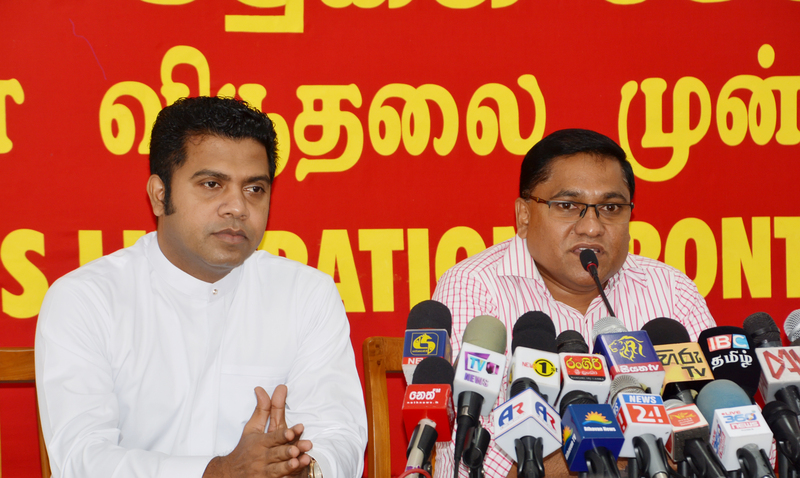 He said this speaking to the media at a press conference held at the head office of the JVP at Pelawatta yesterday (8th). The Member of the Central Committee of the JVP Parliamentarian Dr. Nalinda Jayatissa also was present. Speaking further Mr Herath said, “The bond scam cannot be allowed to be swept under the carpet by punishing Minister Ravi Karunanayaka. There is an attempt to sacrifice Ravi Karunanayaka to get the treasure. Those who have got the treasure want to go scot free. We cannot allow that to happen. For, the treasure belongs to the people. It is people’s funds. The whole gang of thieves who plundered the treasure should be punished and the people should get back their money.